A good cigar is a joy to smoke. Finding a good cigar, though, can be a bit more difficult than it sounds. Sure, there are names out there that you can trust to be consistent, but consistency is only a portion of making a good cigar. You also need to be sure that you are making a cigar with a taste that people are actually willing to spend their money on. 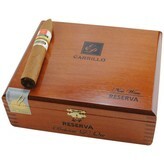 EP Carrillo, luckily, is one of those names that has a long history of making good cigars in the industry. Ernesto Perez-Carrillo himself got his start in Cuba, and has brought that knowledge here to the United States. For the longest time, EP Carrillo was simply working out of his Florida facility, making cigars for other companies, most notably La Gloria Cubana. They took this knowledge, and their history of working for large companies and making fantastic cigars for them, and they applied it to making their own line, under the name’ EP Carrillo’, and in doing so they have made some fantastic cigars that can be had at very reasonable prices. What makes the New Wave Reserva Connecticut delicious? Well, it all begins with the wrapper, a Connecticut wrapper grown in Ecuador, which provides creamy notes and a lighter body than you would get with a darker wrapper. Into the wrapper is placed Nicaraguan and Dominican long-fill tobacco, giving off the taste of wood and a bit of a spicy flavor, along with a Nicaraguan binder. All this comes together to form a great cigar, and if you’re looking to enjoy a great cigar, EP Carrillo can offer you a box of such cigars at a very reasonable price. Here at El Cigar Shop, we go one step further to ensure you the best possible deal on a box of New Wave Reservas....because that's what we do.